Musician and school teacher Evan Rhys Davies was intrigued, intimidated and filled with anticipation when he was invited to develop and teach a pilot creative writing and songwriting course to prisoners in Spring Hill Corrections Facility. That was back in 2009 and he had never taught in a prison before. Nor had he heard of anyone teaching songwriting to prisoners. Once a week for two hours, he would teach a creative writing class of 20 men, followed by a song writing class of eight men. “I began to see and hear all of this talent and once I heard the songs they had written, I decided they deserved to be recorded,” he says. The result was a CD called If These Walls Could Speak: Live recordings from Spring Hill Prison. The novelty factor appealed to the men because it was different to the other courses available to them. But it came with its own challenges. Evan had to keep the creative writing tools and song structure flexible, catering to the various skill and literacy levels. It soon became clear to Evan that music and art had the potential to transcend the walls of the prison and open up the prisoners, enabling them to express themselves more freely and explore their natural gifts. 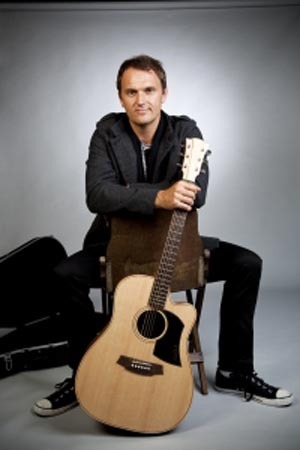 Evan’s experience subsequently inspired the critically acclaimed documentary series Songs From The Inside, which featured on Maori Television earlier this year. A consultant to the series, he says the positive impact on the prisoners at Arohata and Rimutaka Prisons was similar to what had happened at Spring Hill Corrections Facility. You don’t have to know as many chords as musician Warren Maxwell to write and play a song, Evan says. But what you are forced to do through the process is look inside yourself and face your inner demons. Through their songs, they are able to share emotions they wouldn’t necessarily share if they hadn’t been accompanied by a melody. However, he adds, there’s also a lot of value for the prisoners when their songs are heard by someone they respect. Evan is keen to continue his work teaching songwriting in prisons and hopes there will be further opportunities to use the music course he developed and refined, based on his practical experience. “The course could be taught to other tutors and facilitated nationally but run locally,” he says. Original generation time 1.5965 seconds. Cache Loaded in: 0.0008 seconds.